Mango is my favourite fruit. I go a bit crazy when they’re in season. Have them for dessert every night, make mango daiquiris, have them for breakfast. So I decided to try them in muffins. 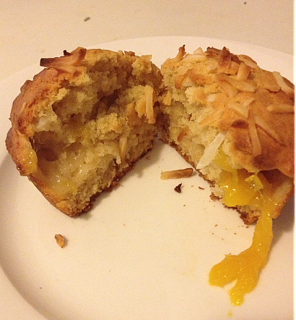 Biting into the juicy mango centre is heaven and the crunchy coconut is like the icing on the cake. They are the taste of summer. Enjoy! 1. Preheat the oven to 180 degrees. Grease a 12-hole muffin tray. Combine flour, sugar, ginger and coconut in a large bowl. 2. In a separate bowl, combine the eggs, milk, oil, maple syrup and essence. Make a well in the dry ingredients and pour in the egg mixture. Stir to combine (don’t over stir, just until the ingredients are combined). 3. Fill the muffin holes to half way. Place some chopped mango on top of each half-filled hole. Top with more filling. 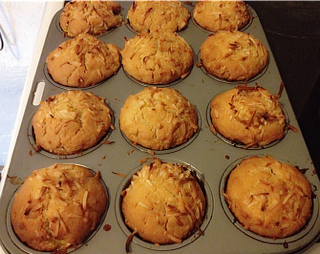 Sprinkle shredded coconut evenly over muffins. Place in oven and cook for 25 minutes. Let them cool for a few minutes. They taste amazing still warm.